You may remember my Pied Wagtail shot from about a month ago? It was my Image of the Week, and my article accompanying the image told of how difficult it was to get a shot of one of the many small birds that live in the United Kingdom. Actually, my exact words were - "...you need the field craft of a soldier, the knowledge of an ornithologist, the reaction time of a formula one driver, the luck of a lottery winner, and the patience of a Saint!" Well, here's a situation I hadn't thought of! I currently have some cartilage stuck in my knee. It means I can't walk or stand for long, so I do a lot of sitting and lying down! I had been hobbling around the garden, taking shots of some of the spring blossom, and listening to the birdsong, when my knee gave way, and I had to sit down on a garden bench. 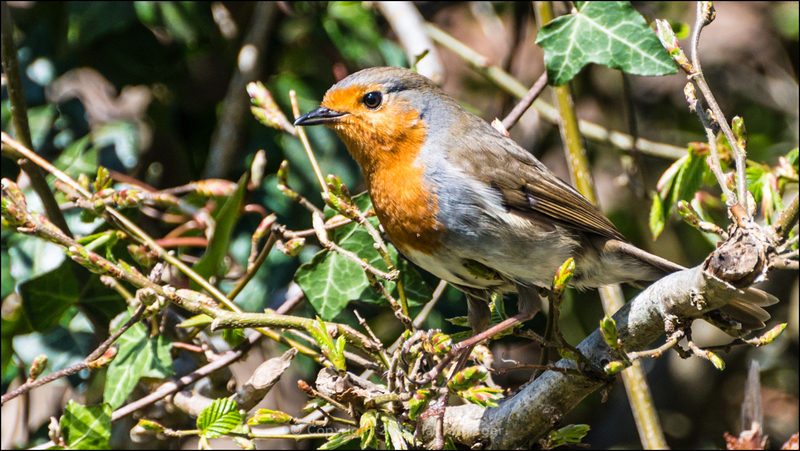 As I sat, the birdsong got louder, and louder, until there, right in front of me, about 10 feet away, was this robin red breast! Back and forth it hopped through the branches of a hedge, collecting insects, and flying off. Only to return a few seconds later for another load of bugs! I almost forgot I had a camera with me! Almost! Thankfully, I managed to grab a few shots before the branches of the hedge had been stripped of all insect life.